This side of his life is not covered as often in the English media as it is in the Thai media. We only get the edicts and hot-headed retorts of our military prime minister. It is not often we get to see his musical side. Military coups in Thailand are not bloody events like they are in other countries. In 2006 when the tanks rolled in, Thai civilians reacted by presenting the soldiers with roses. Things weren't perhaps so rosy in 2014 when the military toppled Yingluck's government. But the moment the army took over, our brand new unelected prime minister did something not too many despots do, let alone think of. He penned a song. It took him an hour, allegedly. This happened not two weeks after the coup. 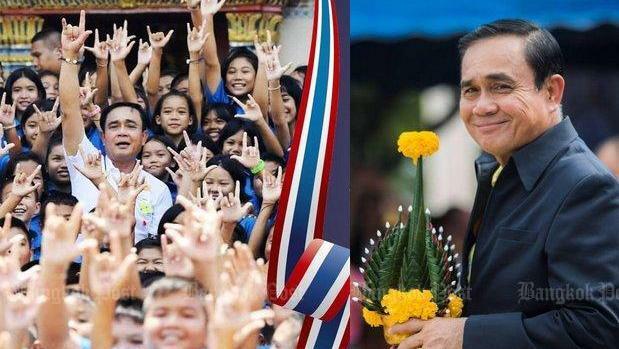 The song was a ballad titled Return Happiness To The Thai People, which became Prayut's catchphrase. He wrote the lyrics, making him the Bernie Taupin of the Thai music world. But as we know, Bernie would be a struggling pensioner today had he not teamed up with his more famous other half in the early 1970s. Where was Prayut's Elton John? Being a brand new military dictator, Prayut had a lot of folks rushing to kowtow and ingratiate themselves before him. A smattering of those glute-lickers were musical types. Before we knew it, a melody had been put to his words and a singer was found. Wasn't that quick? Thailand doesn't have a national song chart like, say, Billboard or the Official UK Chart. We cannot say, then, that Return Happiness was a No.1 smash but by goodness, it would have been Thailand's Gangnam Style had there been such a chart! What a massive hit it was. It's a power ballad, the kind Westlife or the Backstreet Boys probably could have covered in an afternoon in the studio. It's also a love song, the type where the guy pleads with the girl to give him a chance to prove himself. The chorus went like this: "All you must do is trust and put your faith in us. Very soon the country will be great again, return happiness to you, the people!" Red-necked Americans would immediately bristle at these lyrics, for indeed, they appear to be a direct rip-off of “Make America Great Again!”, only this song precedes Trump by two years. Also, MTGA is hardly an attractive moniker sewn onto a red cap. The song has had millions of hits on YouTube, though the official version stands at just 2.9 million. I am surprised by this, or perhaps heartened, considering this country has 68 million people. Clearly not everybody was racing to play the song voluntarily – and this sentiment is echoed by the fact all comments for the video have been disabled. Perhaps there was no need to play it on YouTube, since it permeated daily life at all times and when least expected. There were parody versions, too – the second-highest viewed version featured the Chipmunks. So who teamed up with the prime minister? His name is Vichien Tantipimonphan, a bespectacled, highly-sought-after songwriter who has penned some monster hits in this country. Without detracting from his clear ability to tap into mass musical tastes, the man writes power ballads for television soaps over and over again to the point where they do start to sound a little familiar. Think of Frankie Goes To Hollywood's Relax and Two Tribes. But this guy really does churn out the hits. Do you remember last year's monster TV series, called Buppesaniwat, the period piece about Ayutthaya? Guess who wrote the smash hit from that series all on his own without a military lyricist? I imagine Vichien living in some mansion off Sukhumvit with all sorts of Cambodian maids and Burmese drivers ferrying him to his record company in a gold Lamborghini. There was a mystery surrounding the song as well. As it permeated the airwaves, the question came up – who was the singer? Only in Thailand would a military dictator release a single. Only in Thailand, too, would a song become a hit single without anyone knowing who sang the thing. This extraordinary story, and scenario, does not stop here. The songwriting talents of Chan-o-cha/Tantipimonphan were not confined to the files of one-hit wonder. For a while there, in Thailand at least, they superseded Bacharach-David or Lennon and McCartney. In December 2015, Prayut followed up his debut single with a new song. As any recording artist will tell you, the sophomore album or song is crucial. It makes or breaks you. This time around it was titled Because You Are Thailand (again, about bringing a bright future to Thailand). It wasn't a huge success. An MV featuring Prayut in his various works probably didn't set the charts on fire. At least we knew who the singer was this time round – a man named Sub Lt Pongsathorn Pojit, who to this day has sung on every release since. Then they came, song after song, being released to the public and played often. The entertainment industry is cruel, though. Fame is fleeting. What was popular, say, five years ago is fodder for fuddy-duddies now. By 2018, the artist was grasping at straws. A Valentine's Day single, Diamond Heart (about bringing a bright future to Thailand) while attracting 700,000 views on YouTube also attracted a record number of dislikes, outnumbering the likes by five to one. Fight For The Country (about bringing a bright future to Thailand) came out the same time of Vichien's major success, the song from the TV show Buppesaniwat. The only problem was… Prayut's song was very, very similar. In January 2019, he released In Memory (about bringing a bright future to Thailand) and it stiffed. The magic had gone. Things were looking down. I am reminded of the last gasps of so many other artists – Michael Jackson's Invincible, Katy Perry's Witness, Spice Girls' Forever. His musical career was over; he had worn out his welcome. Earlier this month he released a new song. The eighth of his career. It's called New Day, and it's all about bringing a bright future to Thailand. In the world of music, sometimes it's best just to leave that dead horse alone and move on.